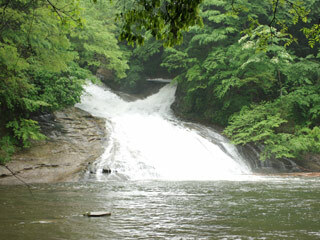 Awamata Waterfalls (粟又の滝, awamatanotaki) is the most popular waterfalls in Boso Peninsula. It is 30m high, 30m wide and 100 long. Awamata Waterfalls is also known as Yoro Great Falls ( 養老の大滝) because it is located on Yoro River (養老川). There is the riverside walkway for 2 km starts from Awamata Waterfalls. There are many small waterfalls and one of the best scenery in Chiba, especially either June with green leaves or autumn with autumn leaves. It is the best waterfalls in Chiba. It offers the great beauty of nature at Awamata no taki riverside walkway which is located the falls. You can enjoy walking at the beautiful valley. In the fall, many trees have the autumn leaves. The sound of the falls and beautiful colors are the best harmony here. The riverside walkway could access from the top of the falls to the bottom of the falls.